As it marks its fifth anniversary, Ramsey County’s Veterans Treatment Court can make a fine boast, according to 2nd Judicial District Court Chief Judge John H. Guthmann. Among the 28 veterans who graduated from the program at least one year ago, the judge said, there has been no recidivism. “We have something big to celebrate,” Guthmann said. Guthmann appeared with several dignitaries and one veterans court graduate at St. Paul’s Landmark Center Wednesday, to celebrate the program’s fifth anniversary. Veterans courts are a form of “therapeutic jurisprudence” that offer structured probation. Veterans who run into trouble with the law because of service-related drug addiction or mental health issues often can avoid jail sentences if they successfully complete the program. According to statistics provided by County Attorney John Choi’s office, Ramsey County’s veterans court currently has 15 enrollees. Of those, 14 are male and one is female. Seven are white, five are African-American and one is Native American. Of the 58 people who have participated over its history, 41 have graduated; 17 were terminated. Successful graduates spend an average of 25 months in the program, according to Choi’s office. Most of them — 39 — have dealt with felony charges. Speaking at the anniversary ceremony, Choi commended the partners who helped get the specialty court off the ground without funding. They included judges, prosecutors, public defenders, veterans advocates and the U.S. Department of Veterans Affairs, he said. Alexander Kempe, 37, an Iraq War veteran, also spoke. 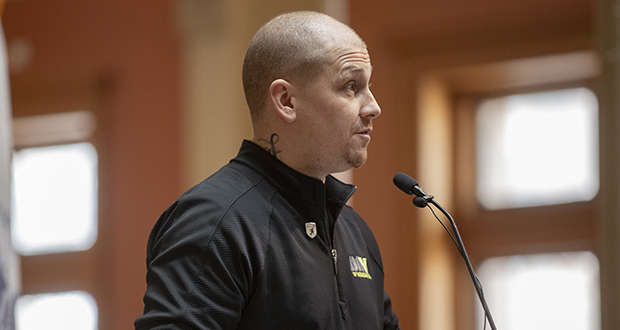 Suffering from what he called “reintegration issues,” he was accepted into the Ramsey County veterans court in 2016 while facing a gross misdemeanor charge for violating an order for protection. While a vet’s court participant, Kempe obtained housing through a joint HUD and Veterans Affairs program, then got his own place. He got a job with Disabled American Veterans as a part-time driver, then was promoted to claims processor. He still works there. While going through the program, he got addiction treatment through the VA Medical Center in St. Cloud, went through aftercare, participated in a mentoring program and cognitive therapy groups, and began working toward completion of a master’s degree. He has also reconnected with his kids, he said. After completing the program, his Ramsey County criminal case was dismissed. “It was an absolute blessing,” Kempe said. He said that completing the demanding program reminded him of a soldier’s core values — loyalty, duty, respect, selfless service, honor, integrity and personal courage — all of which he thought he had lost forever. “Today I am able to hold my head high without looking over my shoulder, which is a huge relief,” he said. 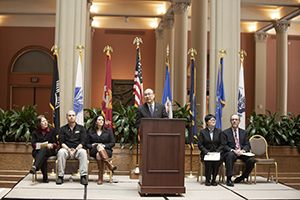 Ramsey County Veterans Treatment Court is a voluntary program for eligible veterans charged with a crime. Its stated mission is to promote public safety through enhanced supervision and individual accountability.